Bed bugs. Those are two of the last words that any homeowner ever wants to hear. 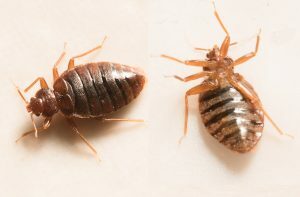 Bed bugs really aren’t that dangerous, but just thinking that you might have little bugs in your bed that bite you is a good enough reason to do whatever it takes to get rid of them. When it comes to looking for a solution to bed bug removal, contact experts that are trained well and carry the proper equipment that it takes to eliminate bed bugs for good. A company like RestorePro in Sandusky, Ohio that specializes in bed bug extermination is your most valuable source. Certified technicians can get your home cleaned the right way – the first time. While it is true that bed bugs do not like the cold, they can survive for days and maybe even weeks in freezing temperatures. If you choose to adopt this method of extermination, you’ll need to leave your bed out in below freezing temperatures for at least a week and that still won’t 100% guarantee full extermination. Yes, most bed bugs are primarily nocturnal. However, this is because they will adapt to your sleeping patterns not because they are nocturnal creatures. Therefore, if your schedule keeps you up all night and sleeping during the day the bed bugs will come out in the day while you are sleeping. Actually, only about 40-50% of people react to bed bug bites. The reactions vary as well. Some people will develop large bumps that are very itchy and possibly painful. Some reactions may lead to nothing more than barely noticeable bumps that do not itch at all. While it is true that bed bugs can carry human diseases like Anthrax, Typhus, and so on, no research has ever shown any evidence that bed bugs can transmit diseases to humans. Even bed bugs that have been given HIV were unable to transmit them to humans. You absolutely can see bed bugs with the naked eye. Full grown bed bugs grow to approximately the size of an apple seed. The much smaller nymphs are more difficult to detect. They are lighter colored and are about the size of a pinhead. You can clearly see them with a magnifying glass. It’s actually impossible to determine the difference between bed bug, spider, and mosquito bites by just looking at them. One reasonably reliable way of knowing if they are bed bug bites is to look for a cluster of bites. That is typically the way bed bugs like to feed. Now that you know some of the common myths associated with bed bugs, hopefully, you never need to utilize that knowledge! If you do find yourself dealing with bed bugs in your home, don’t waste any time before calling the in professionals. You could save yourself time, money, and a giant headache by having professionals come in and clean up the right way. In Sandusky, RestorePro can help exterminate bed bugs for good.